1/2 of the 40 kite train that "Builder Bob" made. Kite trains are so cool. john did you happen to get a pic of the one flying on friday at KP? it was incredible! very nice red train here. will we be lucky enough to see it whole you think? He flew all 40 yesterday, but I didn't grab my camera either Flew great, somebody will try to get a pic next time. I think it was 130+ kites here Darren.. I got some new photos of it this year too. great pictures. unfortunately i guess the scale and length of the thing are just impossible to capture in only two dimensions. if you're lucky enough to see one of these in person, you won't forget it. they're super cool. 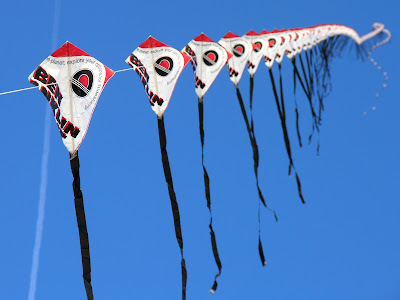 don't mean to hijack the thread as much as share the awesomeness of a cool kite train. you can see the train from the photo above in this video starting around the 00:14s mark. know the patchwork foil you see flying is at around 150 feet and observe how much farther the train is flying!